Citation Information: J Clin Invest. 2017;127(12):4314-4325. https://doi.org/10.1172/JCI94152. Conditional deletion of Emc3 with Shh-Cre. (A) Design of the Emc3 gene targeted allele is shown. The critical exons 4 and 5 are flanked by loxP sites. (B) The breeding strategy to generate Emc3 conditional knockout mice is shown. The Emc3 conditional allele was created after flippase recombination. 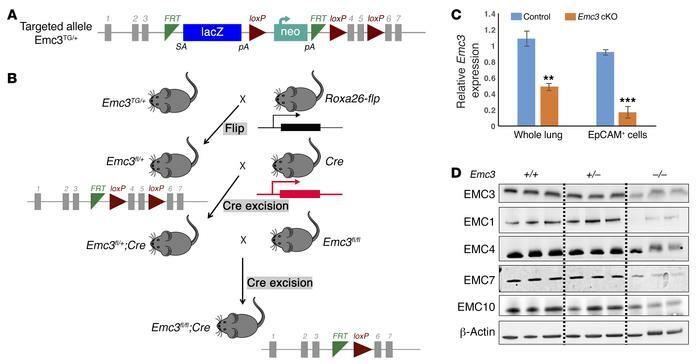 Subsequently, the Shh-Cre promoter–driven targeting cassette deletes exons 4 and 5. (C) qPCR of Emc3 RNA isolated from E18.5 control and Emc3-cKO whole-lung tissue or EpCAM+ sorted lung epithelial cells. Emc3 RNA was significantly decreased in homozygous Emc3-cKO mice. Data are the mean ± SEM. **P < 0.01, ***P < 0.001 using unpaired, 2-tailed Student’s t test. n = 4/group. (D) Whole-lung lysates were prepared from control and mutant mice at E18.5. Western blots were performed using indicated EMC and β-actin antibodies. Levels of all EMC subunits tested were decreased by deletion of Emc3.